The Phoenixes of Ulthuan are attuned to fire magic and can harness it at will. As a Flamespyre Phoenix grows older, its body cools and begins to draw heat from its surroundings. Eventually it’s plumage becomes covered in frost and ice as it becomes a Frostheart Phoenix. 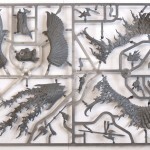 The High Elves Flamespyre Phoenix / Frostheart Phoenix is a multi-part plastic kit with enough parts to build a single model, either a Flamespyre Phoenix or Frostheart Phoenix, and both of these models can be built mounted or unmounted. 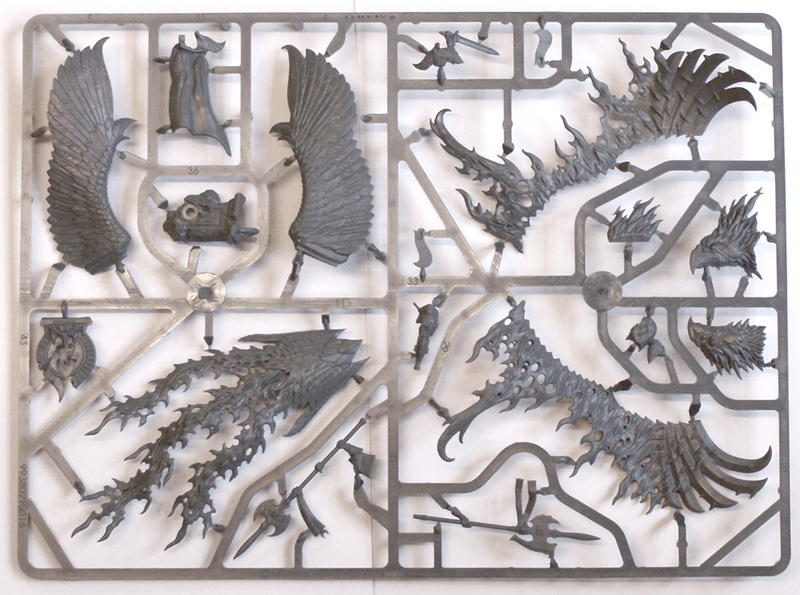 The Flamespyre Phoenix kit is quite simple, it contains a total of just 44 parts – The Phoenix itself can be built with just 14 parts. The Phoenix is as easy to build as it is simple and most hobbyists won’t find a need to refer to the instructions at any point during the build. 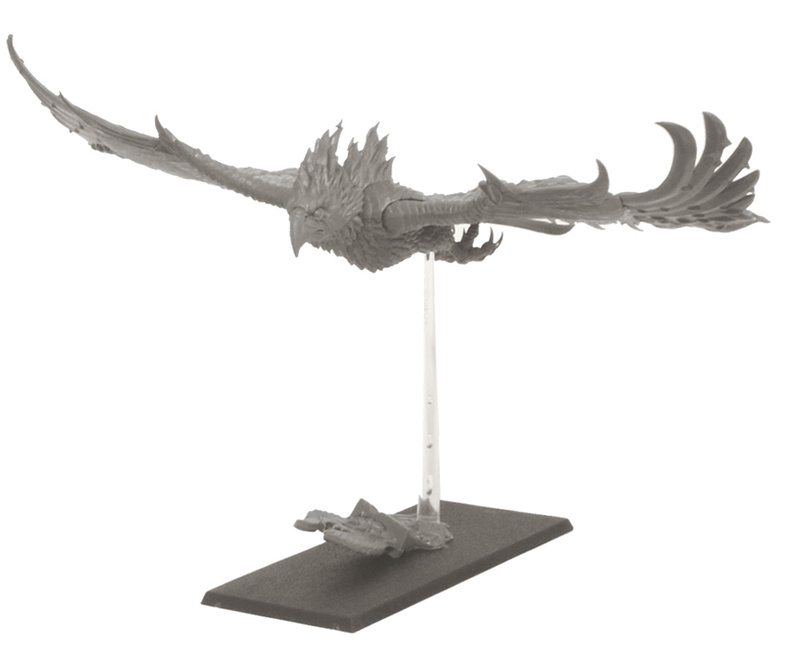 One point of note is the fact that the kit can built with or without a rider, leaving you the option to build the rider on foot if you wish, plus some magnetising would allow you to swap the mounted rider with the back feathers / flames if you wanted to. The two head variants could also be magnetised meaning you can switch to the new character Caradryan and back. 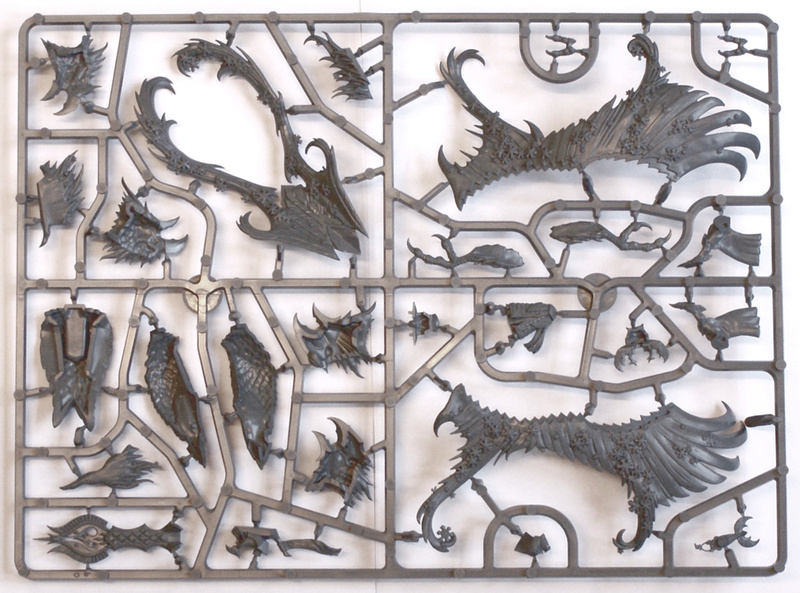 Sadly however, due to the large number of unique components, it is not feasible to build both a Flamespyre Phoenix and Frostheart Phoenix from the same kit. One final comment on the model build would be that the base and model should ideally not be glued together simply for the purpose of transporting the model. When fully assembled and attached to the base the model becomes too big to fit in any conventional carrying case so keep in mind how you intend to carry your new Phoenix to its next battle. The kit is highly detailed but should be simple to paint using a few basic techniques – base coating, followed by some dry brushing (the feathers lend themselves nicely to this technique) and then a layer of wash over the top should produce a great looking result. Once complete, the Flamespyre / Frostheart Phoenix makes for an impressive sight in any High Elves army and is a great new addition to the Glittering Host’s roster. As with any model it’s the rules that can make or break a model and the Pheonixes don’t disappoint. The Flamespyre & Frostheart Phoenix are Rare choices in a High Elves army, with the Frostheart costing slightly more points than the Flamespyre. Glancing over the two entries you can immediately see that the iced version has a slightly increased stat line over its fiery sibling, whilst the Flamespyre has a unique ability, Phoenix Reborn. Upon death it can do what a Pheonix does best; rise from the ashes to live again! You can find out the full rules in the new High Elves army book. 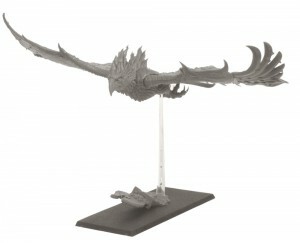 Lastly, value for money, at £35 RRP the Flamespyre / Frostheart Phoenix represents reasonable value for money and is comparable in price to similar Games Workshop kits of a similar price. The Flamespyre Phoenix kit is simple to build, containing a total of just 44 parts – The Phoenix itself can be built with just 14 parts. The Phoenix is as easy to build as it is simple and most hobbyists will find that they do not need to refer to the instructions at any point during the build. 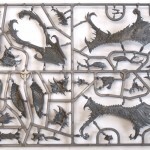 The kit is highly detailed but should be simple to paint using a few basic techniques to achieve great results and once complete the Flamespyre / Frostheart Phoenix makes for an impressive addition to a High Elves army.